This explanation of The California Current is an excerpt from the book California Marine Life by Marty Snyderman. This is a great explanation; it’s easy to read and understand. “The California Current is a major surface current that brings cold water from the Gulf of Alaska into California waters. It maintains a generally slow southward flow throughout the year, though the intensity of the flow varies with the seasons. During late summer and fall, the current tends to hug the coastline of northern and central California more closely than in winter and spring. Another, smaller current called the Davidson Current brings warm water northward along the coast between November and February. If you examine the map of California… you will notice that the entire mainland coast south of Point Conception indents sharply to the east. 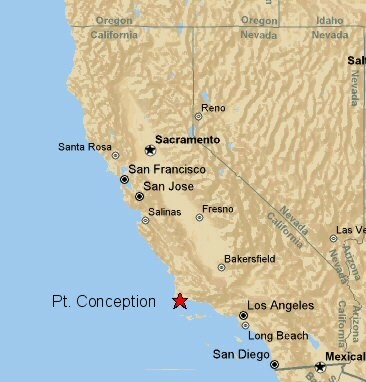 This indentation is referred to as the Great California Bight. The California Current more or less hugs the state’s coastline until it reaches the bight; south of this point the current does not meet the coast again until just about 100 miles south of the Mexican border, along the shores of Baja. Because all eight California Channel Islands lie roughly in the lee of this bight, they, along with the mainland coast south of Point Conception are less immediately influenced by the California Current than are waters to the north of the bight.